As Tunisians’ unhappiness with their country’s direction and their national economy has grown, so has their disappointment in their new democracy. A broad majority (72%) is dissatisfied with how their democracy is working, including 42% who say they are not at all satisfied. In particular, about half of Tunisians (51%) say the current government is doing too little to ensure equal rights for women. Only 23% think the Ennahda-led government has done enough to advance women’s rights, while 18% say it has done too much. Women (55%) are more disappointed with the government’s performance on this issue than men (46%). Frustration with political conditions in Tunisia has sown doubts about the value of democracy in general. Fewer Tunisians now say democracy is preferable to any other form of government, with support declining from 63% in 2012 to 54% today. Roughly two-in-ten (17%) think a non-democratic government can be better in some circumstances, about the same as in 2012. And, nearly a quarter now say it does not matter for a person like them what type of government they have, up 13 percentage points from last year. 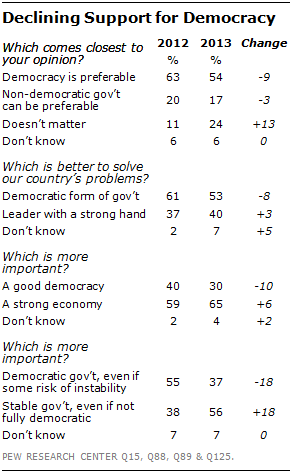 About half of Tunisians still think a democratic government (53%) is better able to solve their country’s problems than a leader with a strong hand (40%). But the preference for democracy is not as strong as it was last year, when 61% chose democracy and 37% said a strong leader would be preferable. A thriving economy and political stability have also become higher priorities relative to establishing democracy. When asked which is more important, fewer Tunisians today choose a good democracy (30% in 2013 vs. 40% in 2012) and more now say a strong economy (65% vs. 59%). A majority (56%) prioritizes having a stable government, even if it is not fully democratic, rather than having a democratic government that may have some political instability (37%). This is a dramatic reversal from just a year ago, when a majority (55%) chose democracy over stability (38%). The decline in support for democracy has occurred across nearly all demographic groups. However, the decline has been particularly precipitous among men on some measures. For example, men’s support for democracy over a strong economy has fallen by 14 points since 2012. There was relatively no change among women. Similarly, men’s backing for democracy rather than a strong leader has slipped 11 points, while such women’s support is virtually unchanged. 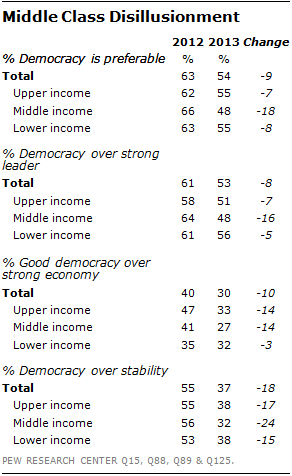 Furthermore, middle-income Tunisians in particular have lost faith in democracy in the past year.1 Across all four measures, middle class support for democracy dropped by double digits between 2012 and 2013. In general, the decline has been less severe among lower income and upper income Tunisians. Nonetheless, although there is widespread dissatisfaction with democracy in action, a broad majority of Tunisians continue to prioritize key components of democracy. Roughly seven-in-ten or more say it is very important for Tunisia’s future to have a judicial system that treats everyone the same way, to have fair elections with at least two political parties, and to have a media that is free from government censorship. About six-in-ten Tunisians prioritize equal rights for men and women and the ability to openly criticize the government. And 53% say it is very important for religious parties to be able to participate in politics. The value Tunisians place on these key principles of democracy has changed little, if at all, in the past year. Still, the economy and stability continue to be top priorities. At least eight-in-ten Tunisians say improving economic conditions and maintaining law and order are very important to the future of their country.